Skillion carports (otherwise known as flat roof carports) are available from OZsteel Garages and Sheds . These provide cover to car parking bays for staff and clients alike. Skillion carports may also be used as covered walkways of any length. In these cases, they can be as narrow as a metre in width. 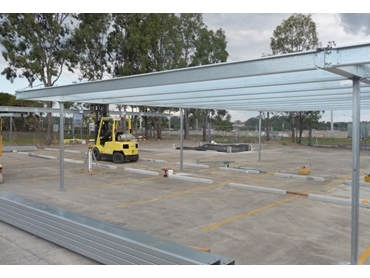 Skillion carports may be constructed as free-standing buildings or attached to a building or house. They can be built onto a slab or with columns into cement footings. These carports are manufactured from fully galvanised steel C-Sections. They have galvanised RHS columns. A full Bluescope Colorbond colour range is available for selection. They come in DIY kits and are available in any size with a standard range of up to 9m clear span. The gable roof pitches are of 10, 15, 20 or 25 degrees.